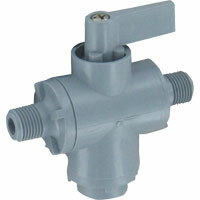 Shut-Off Valve is constructed of solid gray PVC, has Buna-N seals, and a rotating flag handle. Can withstand a maximum operating pressure of 125 psi. Can be used to hook 3 instruments together, as well as testing various gages and transmitters.